The New Richmond Exempted Village School District scored above the state established cut scores in all 2015 Ohio State Assessments for grades 3-8 in Reading, Math, English Language Arts and Social Studies and over the state cut in 2015 end of course exams in preliminary results released Nov. 20 by the Ohio Department of Education. 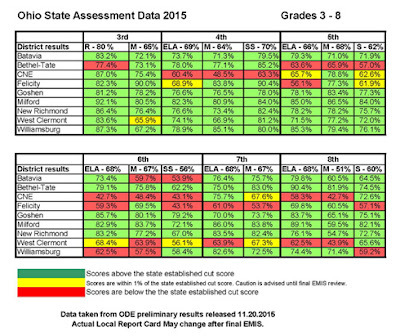 District totals for grades 3-8 include averages of 75 percent or better in 12 of 16 state indicators and above 80 percent in five indicators. "I am thankful to work with so many hard-working and dedicated people committed to serving our community," Supt. Adam Bird said in releasing the results. "I am also thankful for all that our teachers, administrators, and students did to prepare for the common core assessments last spring. New Richmond is a special place and I am happy to have entrusted my children in your hands these many years."